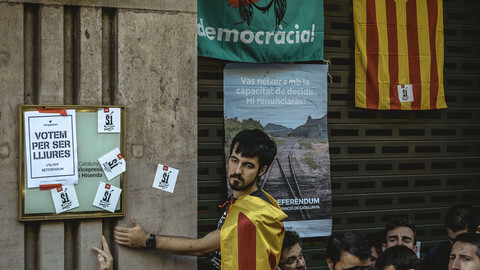 Catalan separatist leaders will press ahead with the region's independence in the wake of a referendum on Sunday (1 October), which the Spanish government said "did not happen". 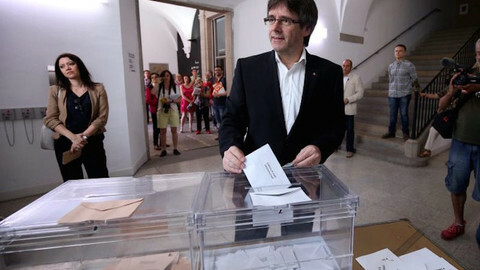 "With this day of hope and suffering, the citizens of Catalonia have won the right to an independent state in the form a republic," Carles Puigdemont, the president of the Catalan government, said at the end of a day marked by Spanish police violence inside and outside polling stations. A meeting of the Catalan government was called on Monday morning, and the regional parliament could meet on Monday or Tuesday to declare Catalonia's independence. On Monday morning, the region's authorities said that more than 2.2 million people voted - a turnout of 42.3 percent - and that the Yes to independence won with more than 90 percent. 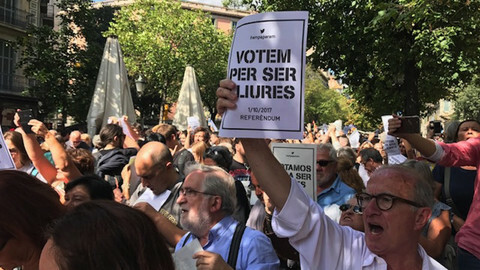 But the vote, which had been declared illegal by the Spanish Constitutional Tribunal, was held with no electoral roll and no independent electoral commission. "There was no referendum today," Spanish prime minister Mariano Rajoy said in a TV address. He called on Catalan separatists to "give up on taking new steps that lead nowhere". He said that "the vast majority of the people of Catalonia refused to participate in the secessionists' challenge" and that "the constitution has prevailed". 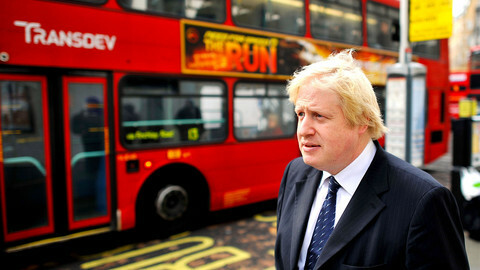 "We have done what we had to do," he said, calling the referendum a "premeditated and conscious attack" against Spain. "We have fulfilled our obligation to defend the rule of law. We have acted within the law, and only within the law," he said. 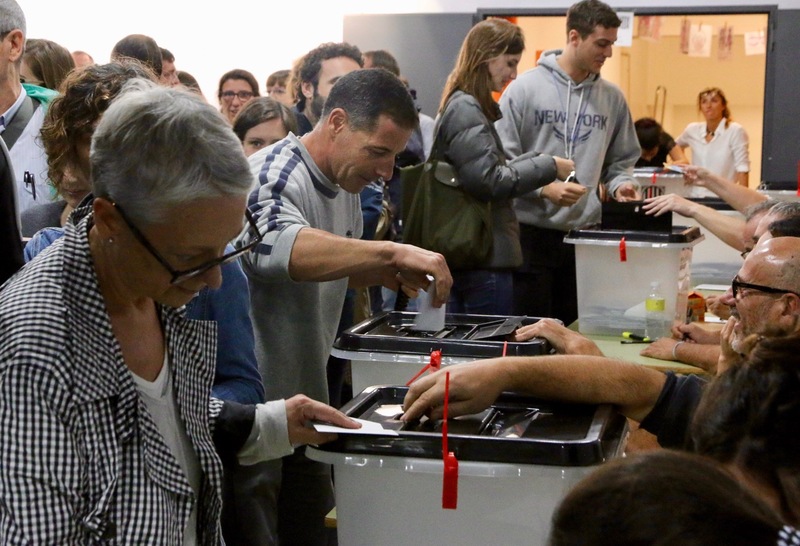 Over the past few days, the Guardia Civil, Spain's police, seized ballots and removed people from polling stations by force. Rubber bullets were also fired. Catalan authorities said that more than 800 people were injured. At the Maragall Secondary School Institute, in the Eixample neighbourhood in central Barcelona, people had started to arrive at five in the morning to help prevent the police from closing the polling station and confiscating the ballot boxes. "We will vote! We will vote!" people shouted when the school opened its doors at nine. The crowd cheered and clapped when people came out after having cast their vote. David Vidal had tears in his eyes and a smile on his face while embracing his wife and son as they came walking out of the polling station. "We queued for a long time but finally we made it!" Vidal told EUobserver. "I'm not sure how to explain it: I feel a lot of happiness, but also a lot of sadness at what has happened with the people that have been hurt." Unlike some other polling stations in Barcelona and across Catalonia, the Maragall Institute only had two Catalan police officers standing a bit further away from the crowd and guiding traffic away. But there were also fears that the Guard Civil would arrive in their anti-riot gear. At one point in the morning, people thought they were coming. Elderly and families with children were hurried away while the rest of the people huddled close together towards the door of the institute. It was a false alarm, but the news and footage that people had heard over the portable radios and seen on social networks shocked the voters who were queuing. Inside the Maragall polling station, volunteers coordinating the fast stream of people coming in to cast their ballot called on voters not to "waste [their] time with selfies, please." They wanted to get as many to vote before either the network went down or before the police came in - or both. Voting had started very slowly in the morning, as a lack of a proper internet connection made it difficult to check the citizens' right to vote - with volunteers using a mobile app at the election tables. But later a better data connection started to speed things up. Families with children, the elderly and the ill were given priority. Once inside, people picked up a ballot and an envelope, and had their ID noted and checked on the app, and cast their vote. Many people cried with joy but most cheered with happiness and euphoria. "I have voted for the first time," said 18-year-old Martina Vergol. "It was very emotional, I came out crying." She had spent the night inside the building with friends and others to keep the polling station open. 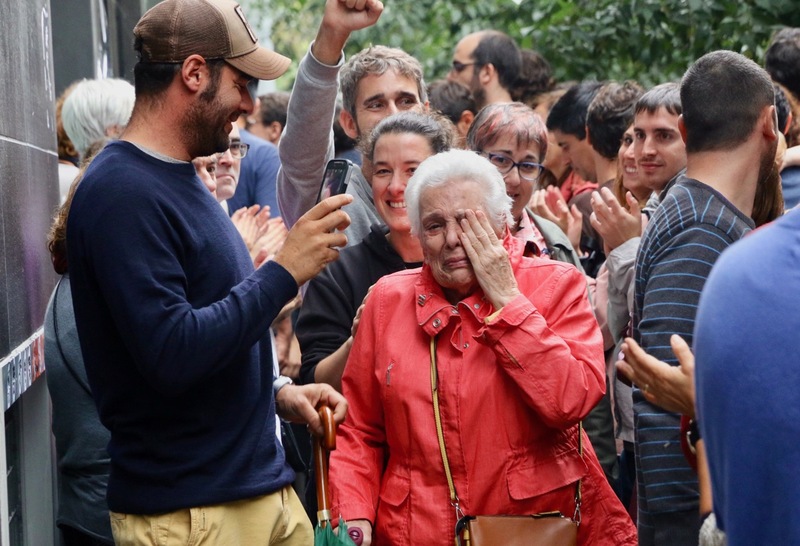 They went outside when the ballot boxes arrived at 7am and stayed there with the crowd until all the votes had been counted and the results had been reported. "It has been a very intense day and it still is," she said. "We have to stay here, but it is very scary." "The easy way out would be to leave, but what do you do afterwards, then? Now we are all here trying to protect our vote with our body. We'll allow them to hurt us just to gain time, it's crazy," she said. During the day, organisers advised people that if the police came, everyone should sit on the ground to make a human shield and buy time to hide the ballot boxes. They were also advised to do so while the votes were being counted. "This is the first time I'm sitting on the street, and I am 77 years old," said one woman with a smile. When voting stopped at eight in the evening, the crowd started to chant: "We have voted! We have voted!" 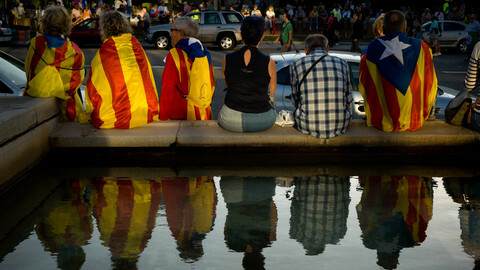 Thousand of people gathered on Barcelona's Catalonia Square in the evening, to wait for the vote's results. 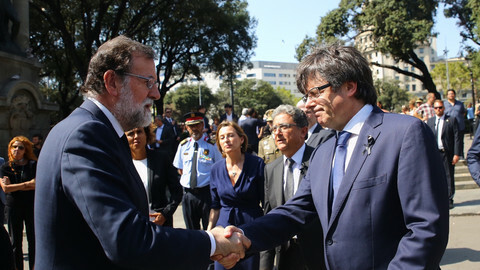 They listened to the declarations by Catalan and Spanish political leaders. Catalan leader Puigdemont denounced a "brutal repression" and said that Spain wrote a "shameful page in the history of its relations with Catalonia". The Spanish PM said he was - "as always" - open to dialogue and that he would address the Congress of deputies on Monday. Pedro Sanchez, the leader of the Socialist Party, the main opposition party, called on Rajoy to "negotiate, negotiate and negotiate" with the Catalan leadership. He said that both Rajoy and Puigdemont were responsible for the violence on the day. Albert Rivera, the leader of the centrist Ciudadanos party, said he supported Rajoy against Puigdemont's "attempt at a coup" but that Rajoy had been "naive". Radical left Podemos leader Pablo Iglesias condemned police violence and said that Rajoy "shamed" Spaniards. Before addressing Spanish citizens on TV, Rajoy had spoken with German chancellor Angela Merkel. Spain's EU partners reacted cautiously, with only Belgium's and Slovenia's PM expressing concerns about the violence. 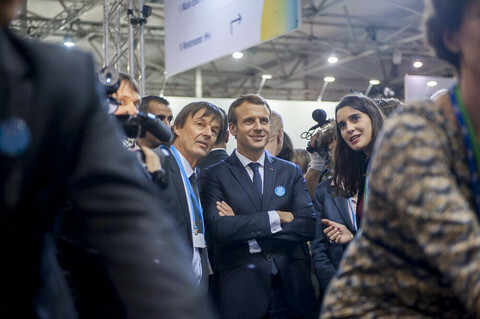 As of Monday morning, the presidents of the European Commission, Council and Parliament have still not reacted. As the EU digests events in Catalonia, Brexit also features high on the agenda this week.